I love cooking pies. To me they are homely and go hand in hand with this cold Melbourne weather. Try these Organic Eggplant & Mushroom Pies today. Perfect of that little vegetarian in you! organic milk or egg white to brush pastry. Cook pasta in saucepan of boiling water (add a touch of salt and oil) until tender; drain. Heat oil in frying pan, cook onion and garlic until softened. Add wine and cook until evaporated. Stir in tomato paste and diced tomatoes; bring to the boil and simmer uncovered for 15 minutes. Combine pasta and tomato sauce in a large heat proof bowl, add egg and cheese; stir. Spoon mixture into ramekins and brush edges with egg white. Cover ramekins with pastry. Have these pre cut to make things easy. Using left over pasty make some patterns to put on your pastry tops. 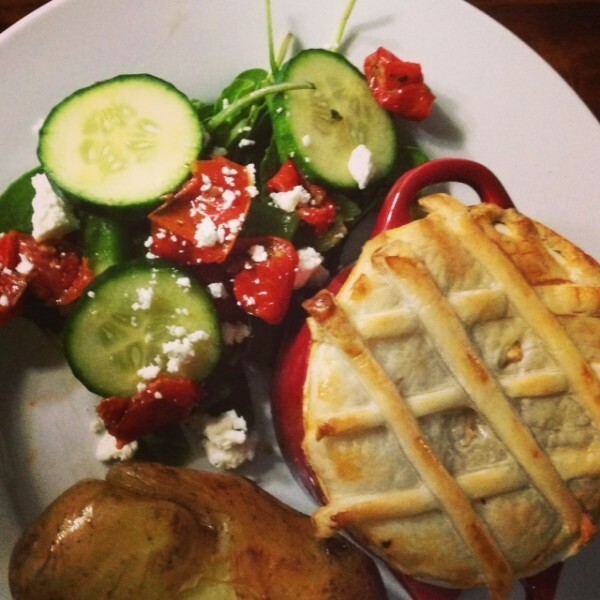 We served these delicious pies with a small salad and potatoes we had baked in the fire. This made 8 pies. We froze the left over filling for another dinner or lunch time meal.